There’s something so fun about these Grilled Vegetable Kabobs! 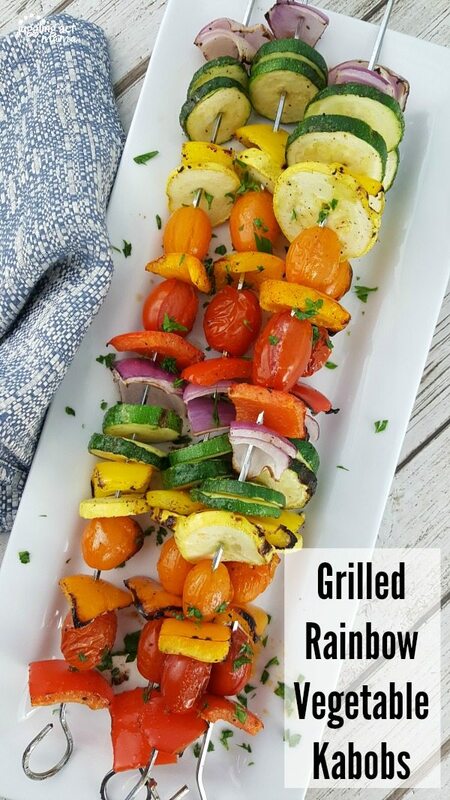 These Rainbow Grilled Vegetable Kabobs are totally beautiful and are perfect for company because they look so impressive. I love the end of summer. The veggies are ready to be picked. Everyone is getting ready for back to school. This is a time when we gather together and spend more time at family dinners. One of my favorite ways to cook for my family is out on the grill. The flavor of fire-kissed meats and veggies is always a crowd-pleaser. And since my kids love helping to make these grilled vegetable kabobs, they are more likely to eat them! So gather up your favorite vegetables, get your kids to help, and enjoy this amazing recipe. This can be a fun project to do with the kids. Obviously, you want to be the one handling the knife, but after all of your fruits and veggies are chopped, the kids can help you make a pattern. My daughter loves laying out all the ingredients in the order of the Rainbow for me to assemble. Older children can help thread the fruit and veggies on to the skewers. This makes such an impressive side dish with all the beautiful colors! Plus, as an added benefit, when kids help to cook the veggies, they are more likely to eat them! Here are all the foods you’ll need to make your own grilled kabobs. Feel free to add in your favorite veggies to the list. What Are The Best Veggies for Kabobs? Grilling kabobs are my favorite way to cook seasonal veggies straight from the garden. All of the ingredients in these scrumptious skewers can be grown in your backyard. So think of peppers, tomatoes, squash, and onions. But if you want to try some different vegetables, this is a fun way to do it. Add in some mushrooms and pineapple for a little different flavor and texture. This recipe makes 4 large vegetable kabobs. If you are cooking for a crowd, I recommend buying more veggies. 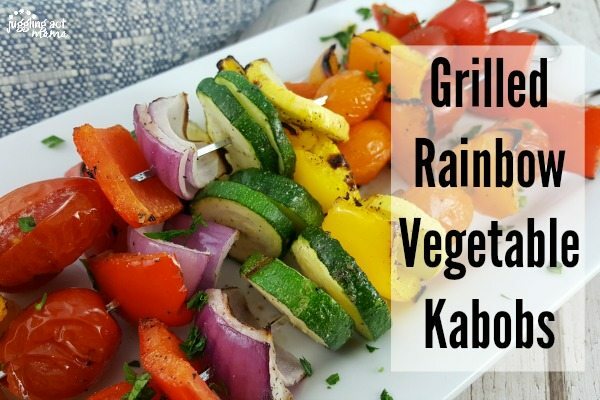 These Rainbow Grilled ​​​Vegetable Kabobs are totally beautiful and are perfect for company because they look so impressive. Begin by preparing the vegetables. Cut the zucchini and squash into round slices. Chop the peppers and onions into pieces. 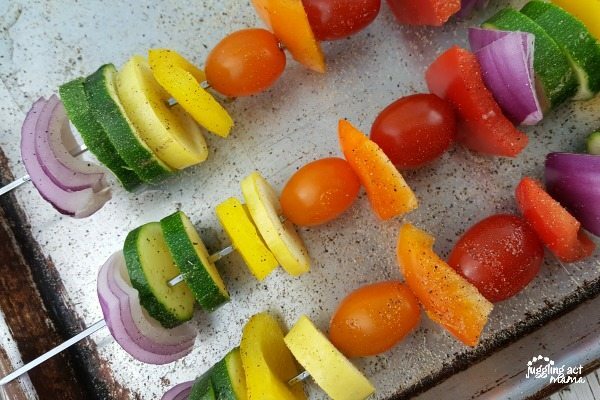 Thread the vegetables onto the skewers in a rainbow pattern. Brush the kabobs with olive oil on all sides, then season with the granulated garlic, salt, and pepper. When the grill reaches medium-high heat (about 350-400 degrees F), place the skewers on over indirect heat. Close the lid and cook 3-4 minutes. Turn the skewers using tongs and cook another 3-4 minutes until the vegetables are tender. Take care not to overcook. Remove to a serving plate and garnish with parsley, if desired. 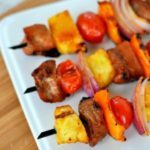 What Sauces Or Glazes Can Be Used on Vegetable Kabobs? Honestly, my family and I all love the taste of the vegetables with just a little salt and pepper and oil. But I will admit that a glaze takes shish kabobs to an entirely new level. If you want to try a glaze for your grilled vegetable kabobs, you can use any marinade that you use for your meats. Honey and Balsamic vinegar are an incredible combination. You can also use some of my chipotle marinade on the veggies too. Keep your grill at medium-high heat, which is about 350-400 degrees F. To prevent your vegetables from burning, cook them over indirect heat and turn them over after about 3-4 minutes. It won’t take long for them to cook. When they are done, remove to a serving plate and garnish with parsley, if desired. The parsley adds some beautiful color but also adds a pop of flavor. These grilled vegetable kabobs, paired with my chipotle marinated chicken, make a fantastic weeknight meal. Do you want more ideas? I have a free mini-cookbook just for you! All you have to do is click the image below and sign up. Then, my top 5 weeknight meals will be delivered straight to your inbox. 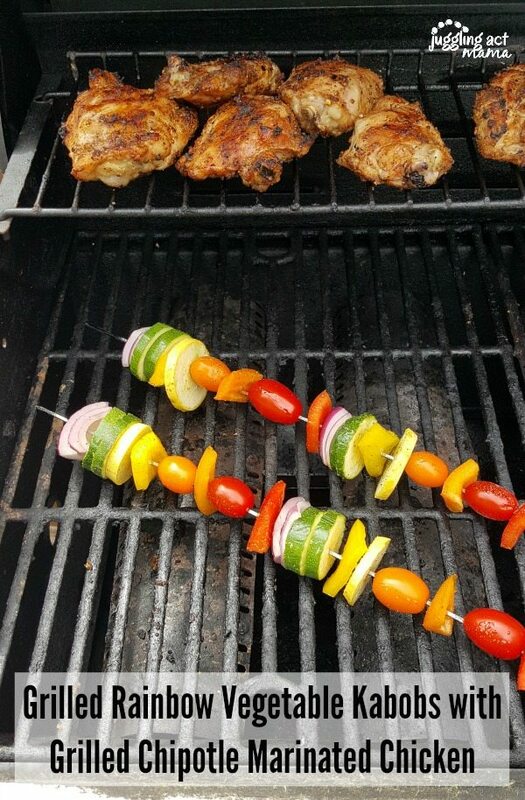 What are the Best Skewers for Grilling Vegetables? I recommend investing and metal skewers so you don’t have to worry about pre-soaking wooden ones. You also don’t have to worry about them splintering. Plus, the metal skewers last so much longer than the wooden ones. After you make your first veggie kabobs you’ll definitely want to make more. It’s a fun side dish and a break from the ordinary. 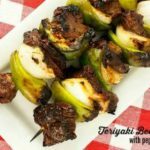 You can serve these kabobs right on the skewer or take them off and toss them with pasta in a simple dressing for a grilled pasta salad side dish. Either way, you have a beautiful, flavorful, and tasty dish! 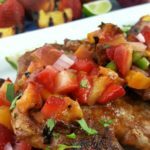 If you’re looking for a protein to serve with these, check out my Grilled Chipotle Marinated Chicken! These recipes will be perfect for your next BBQ or cookout. Grilled Fennel – She Loves Biscotti – Fennel is one of the vegetables you probably don’t make very often. This recipe is a perfect way to try it out for the first time. Garlic Herb Grilled Potatoes in Foil – Diethood – This is a classic side dish. If you haven’t made this yet, you have to give it a try! Grilled Peppers with Goat Cheese – Garnish With Lemon – The creamy goat cheese is pure perfection in the crispy grilled peppers. My household loves their fair share of vegetables so we will need to give this a go this summer!